Occupation: I work in the financial industry, analyzing international banks. This is my second year riding. Last year, along with 13 other i-CERV (Ismaili Community Engaged in Responsible Volunteering) volunteers, I participated in the ride. After having been introduced to Best Buddies and its wonderful objective of enhancing the lives of people with intellectual disabilities, several of us decided to challenge ourselves and ride in the event. For some of us the challenge of a long bike ride appeared easy. 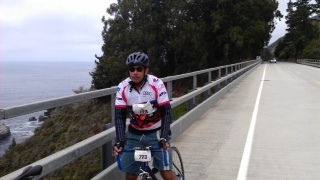 I had not ridden for many years, but instead played other sports, so I thought the bike ride would be easy. After the first couple of training rides we realized that this was “no ride in the park” and a mountain bike was not going to cut it. Needless to say, now we are hooked and regularly bike every weekend. As part of the Best Buddies community, we can see the kind of opportunities Best Buddies brings about for people. Helping to improve the quality of life of others reflects Islamic values of compassion, generosity and care for those in need. As part of our social responsibility, we are happy to participate in this effort and support Best Buddies. Additionally, we have the opportunity to work with like-minded people and enjoy the added benefit of becoming healthier along the way. Having participated last year, there was no question of not being a part of this initiative. In fact, all year, many of my teammates have continued to ride regularly to prepare for this event, and have tried to get others interested in getting involved. This year, I will be riding with 10 teammates who are all I-CERV volunteers. And another 20 I-CERV members will be volunteering at the event. Team Maria was the obvious choice for our team as I-CERV has worked with Maria Shriver in other initiatives that impact the lives of our fellow citizens. We participated in the Alzheimer’s March in 2009 and the Women’s Conferences in 2008 and 2009. For us, this is a good fit, working together to become agents of change. Earlier this summer, I was riding along with my teammates, when I had a fall, and ended up surfing along the Pacific Coast Highway tarmac on my chin! I broke my hand and had stitches on my face. However, thanks to the head gear and gloves, which in my opinion should be mandatory wear for all riders, the injuries were not too serious and I have recovered just in time for the ride. The inspiration to ride again despite all this came easily. Once you are a Best Buddy Team member, the inspiration comes from within. You can see amazing examples of people with intellectual disabilities being given opportunities to be contributing members of society, and you cannot fail to experience pride in what they can accomplish ….and satisfaction for your small contribution towards this end.